Tonight I’m going to be reviewing the supplement Aminolast which is made by the popular Gaspari Nutrition. 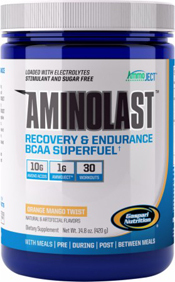 Aminolast is a recovery and endurance BCAA based supplement. I picked up this supplement a few weeks ago, and I’ve had enough workouts sipping on Aminolast that I can do a full review of it. Basically this is a Branch Chain Amino Acid (BCAA) and electrolyte supplement that will help speed your muscle recovery and reduce soreness in your muscles. The “aminojet” technology is designed to help rid your muscles of waste products. Among the ingredients are L-Leucine, L-Taurine, Leucine Peptides, L-Isoleucine, L-Valine, and L-Ornithine L-Aspartate. You will be getting a total of 10 grams of amino acids with one scoop. The label says that you can take Aminolast at anytime before training, between meals, during your workout, or post workout. This makes sense as the product is based around amino acids which can be taken anytime. Personally I take mine throughout my workout mixed in a blender bottle, but I will also sometimes drink it again a few hours after my workout, on my off days, or when I’m playing a round of golf. There have been different studies suggesting different amounts of BCAAs daily, but I always try to get 20+ grams per day. In the regular size bottle of Aminolast you will get 30 scoops worth, which is good for 30 workouts if you are taking them during your workout. If you’re like me and like to make sure you have sufficient BCAAs available for your body you may be taking one scoop twice per day which would last you 15 days. The price is similar to other BCAA products on the market, but Aminolast is one of the best what I would call Intra-Workout supplements. One bottle online goes for about $30. Taste Review – I picked up the Strawberry Kiwi bottle of Aminolast and I actually really enjoyed it. I thought the taste was good enough to go ahead and order it again for my second bottle which is on its way now. From what I’ve read online the other flavors are good tasting as well, but I thought why not just stick with Strawberry Kiwi since I really enjoy it. The mix-ability is decent, although sometimes after a few good shakes in my blender bottle I will see some of the supplement floating around and will have to shake it up some more. Overall for the taste review I give it a 8.5/10. BCAA and intra-workout products are hard to judge their effectiveness, but looking at the ingredients you can tell this is a quality supplement. It sits well in my stomach while I workout and I love drinking it over water when training. Recovery always seems great after workouts and I’m always ready to get back at it the next day after taking Aminolast. Overall this is a great BCAA and intra-workout supplement and for review purposes I give it a 9/10. Aminolast is a great intra-workout supplement by Gaspari Nutrition with Branch Chain Amino Acids (BCAAs) and Electrolytes that I rate a 9 out of 10.